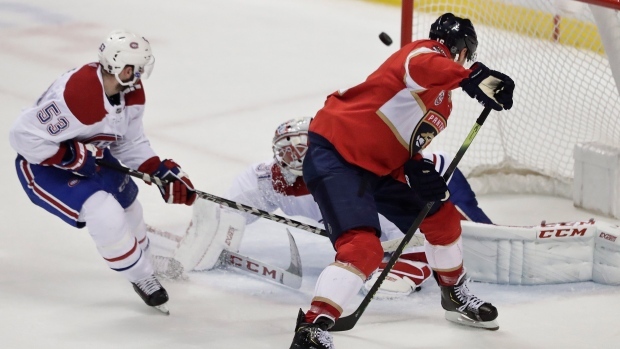 SUNRISE, Fla. — Aleksander Barkov finally scored the goal he's been dreaming about. Barkov's second goal gave the Panthers a 4-3 lead on a spectacular shot with 2:11 left in the second. Barkov skated in on goalie Carey Price, then, with a defenceman on his back, shot from between and behind his legs in front of the crease, flipping the puck high into the net. The Panthers regained a two-goal lead when Vatrano's shot went off a Montreal defenceman's stick and past Niemi with 6:03 left in the first. Niemi was then replaced by Price. NOTES: The Panthers recalled G Sam Montembeault from AHL Springfield. ... G Roberto Luongo is on bereavement leave. ... Barkov reached the 20-goal mark for the fourth consecutive season. ... F Jamie McGinn played in his 600th NHL game. ... The Panthers held a pregame ceremony in honour of the one-year anniversary of the tragedy at Marjory Stoneman Douglas High School in Parkland, Fla. Both teams flanked family members for a ceremonial puck drop. ... Canadiens F Jonathan Drouin played his 300th NHL game.